FREE APPRAISAL. 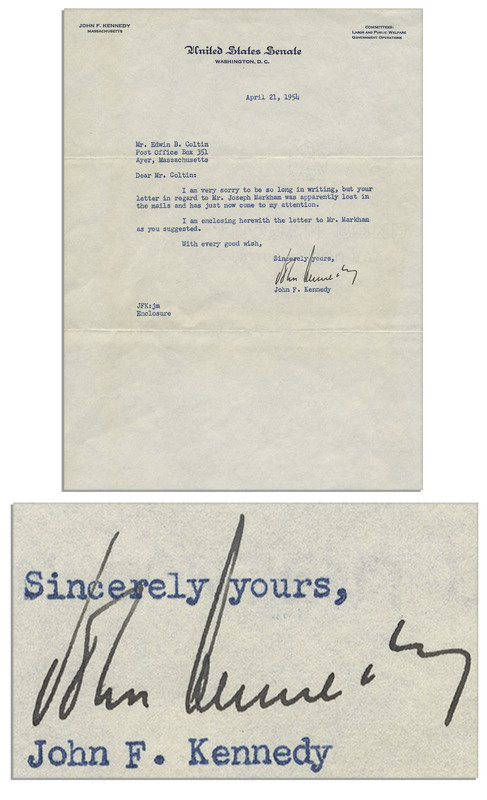 To appraise, buy, sell or consign a John F Kennedy autograph, John F Kennedy document signed or a John F Kennedy autograph letter signed, please email Nate@NateDSanders.com or call Nate D. Sanders at (310) 440-2982. Thank you from Nate D. Sanders Auctions (http://www.NateDSanders.com). This John F Kennedy autograph analysis book now costs over $200 to obtain. Reprints of this book were made in mass in the 1990’s though. Here at NateDSanders.com, of course, all we sell are authentically signed John F Kennedy autograph items. 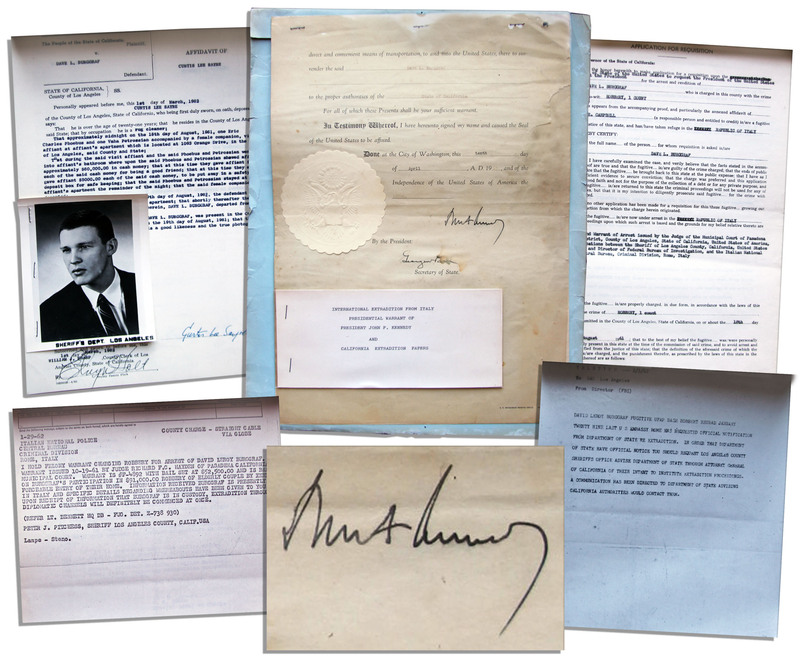 Here are a few John F Kennedy autograph items we have sold and their prices. 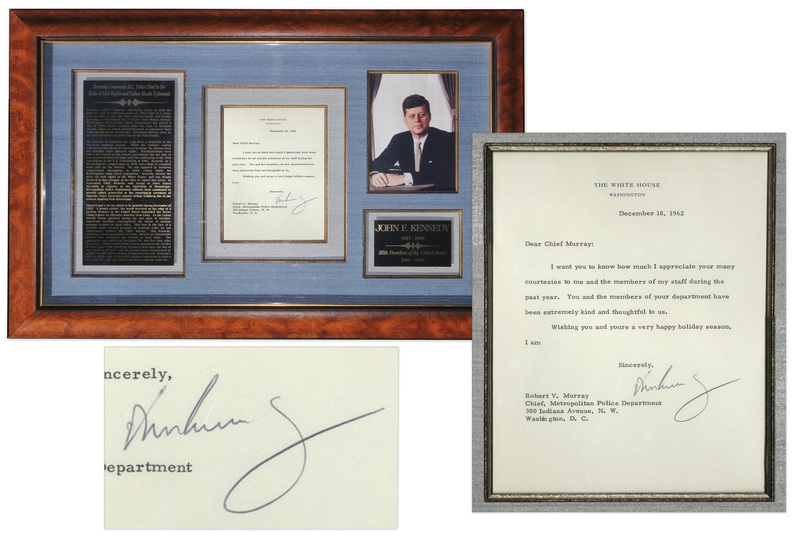 We can obtain up to these prices or more for your John F Kennedy autograph items — please email Nate@NateDSanders.com. 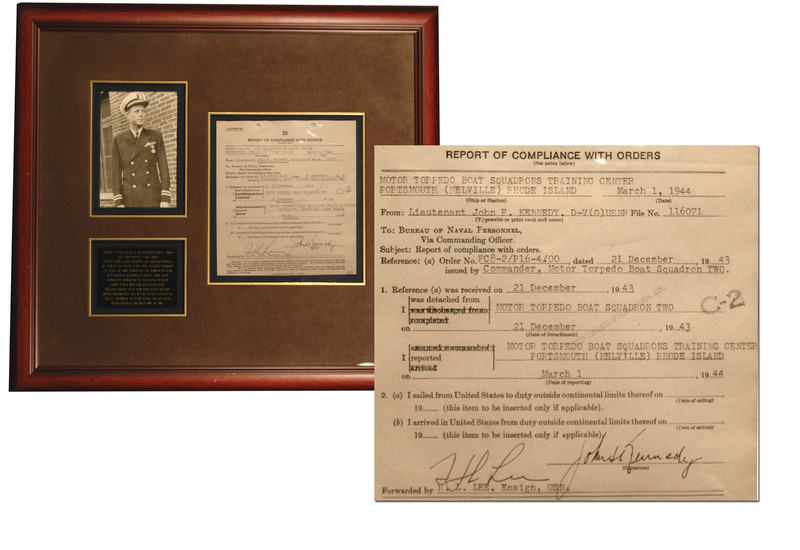 Historically significant John F Kennedy autograph World War II document regarding torpedo boat training, after his command of PT-109, the torpedo boat that was hit by a Japanese destroyer in 1943. Dated 1 March 1944, Lieutenant Kennedy signs a military “Report of Compliance With Orders” at the “Motor Torpedo Boat Squadrons Training Center” after the famed PT-109 affair that distinguished Kennedy as a war hero and set the stage for his future political career. Beautifully signed in bold black ink, “John F. Kennedy.” Framed and matted with a photograph of JFK in uniform and a plaque. Very early John F Kennedy autograph. Measures 22″ x 20″ overall. Fine condition. Sold for $14,670. John F Kennedy Autograph on a 1944 PT-109 Document. Click to enlarge. John F Kennedy autograph on a typed letter ”John Kennedy” as President, who here faces a delicate Civil Rights issue early in his Presidency. On White House stationery dated 28 March 1961, JFK writes to New Jersey Congressman Hugh J. Addonizio, who had written the President two weeks earlier when one of his constituents, a black woman, was denied lodging in South Carolina while attending the Civil War Centennial Commission. Kennedy writes, ”Thank you for your letter of March 14th in connection with the Civil War Centennial Commission’s Assembly scheduled for April 11 and 12. I want you to know that I wrote the Chairman of the Centennial Commission on March 14th requesting that the Commission, as an official body of the United States Government, take action assuring that the arrangements for its Assembly meet the standards of nondiscrimination set forth by our Constitution. 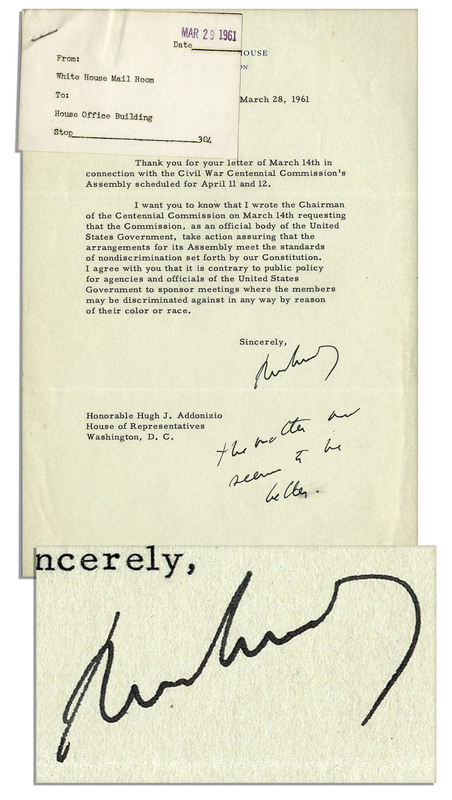 I agree with you that it is contrary to public policy for agencies and officials of the United States Government to sponsor meetings where the members may be discriminated against in any way by reason of their color or race.” Kennedy finishes the letter by adding a handwritten postscript, ”the matter now seems to be better.” However, according to an article in the 6 May 1961 edition of ”The Richmond Afro-American” entitled ”What It’s All About,” Kennedy’s request was apparently rebuffed: ”…Russia successfully put a man in outer space at the same time that America unsuccessfully tried to get a colored woman in a South Carolina hotel…” the article reads. Instead, a Confederate flag was raised at the South Carolina State House during the event. Single-page letter measures 7.25” x 10.25”. In near fine condition with just a smudge to the end of Kennedy’s note. Transmittal note from the White House Mail Room is stapled to the upper left corner. From the family of Congressman Addonizio’s secretary M.M. Sullivan. With a COA from PSA/DNA certifying the John F Kennedy autograph as authentic. Sold for $5,000. Very scarce John F Kennedy autograph on extradition orders as President in 1963. International extradition document is signed boldly ”John F Kennedy” in black ink. Fugitive Dave L. Burggraf was accused of robbery in California and apprehended in Italy. Packet includes California extradition papers, an FBI teletype, a copy of the telegram sent to Italian National Police and a Los Angeles Sheriff’s department photo of Burggraf. The form signed by Kennedy is counter-signed by George W. Ball as acting Secretary of State. Complete stapled packet runs 14pp. Signed page bears a large white seal and measures 10.5” x 14.5”. Toning, dampstaining to Ball’s signature and a tear to the right edge, overall very good condition. The only such extradition order we have seen with a President John F Kennedy autograph. Accompanied by a PSA/DNA COA certifying the John F Kennedy as authentic. Sold for $4,061. 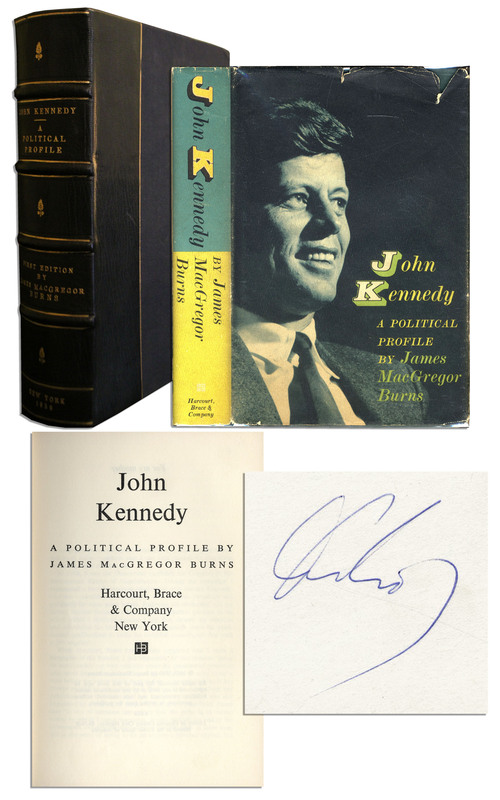 John F Kennedy autograph on the biography of him published the year of his Presidential election, ”John Kennedy: A Political Profile” by James MacGregor Burns. Harcourt, Brace, and Co.: New York: 1960. The front free endpaper is signed with blue ballpoint pen. Runs 309pp. and measures 5.5” x 8.25”. Toning, creasing and some tears to dustjacket edges, else near fine. With slipcase and PSA/DNA COA stating that the John F Kennedy autograph as authentic. Sold for $3,691. Very rare photo with a John F Kennedy autograph while serving his second term as Senator from Massachusetts. 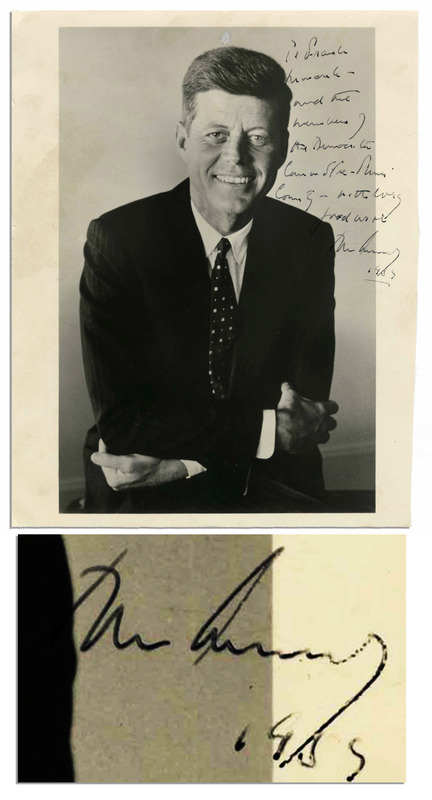 JFK inscribes and signs this engaging photo in black ink: ”To Frank Minarik and the members of the Democratic Committee – Pima County — with every good wish / John Kennedy / 1959”. Pima County, Arizona is where Minarik was active in the Democratic Party and had been a delegate to the 1952 Democratic National Convention. 8” x 10” semi-matte photo has been trimmed slightly on the right side and shows light soiling. A small spot of white-out appears above Kennedy’s head, not very noticeable as it blends in with the background color. Kennedy’s writing is still bold and strong. Dark John F Kennedy autograph. Overall in very good condition and accompanied by a PSA/DNA COA attesting that the John F Kennedy autograph is authentic. Sold for $3,691. Rare copy of ”The White House” with John F Kennedy autograph. and Jackie Kennedy autograph as President and First Lady. Published by The White House Historical Association: Washington, D.C.: 1962. 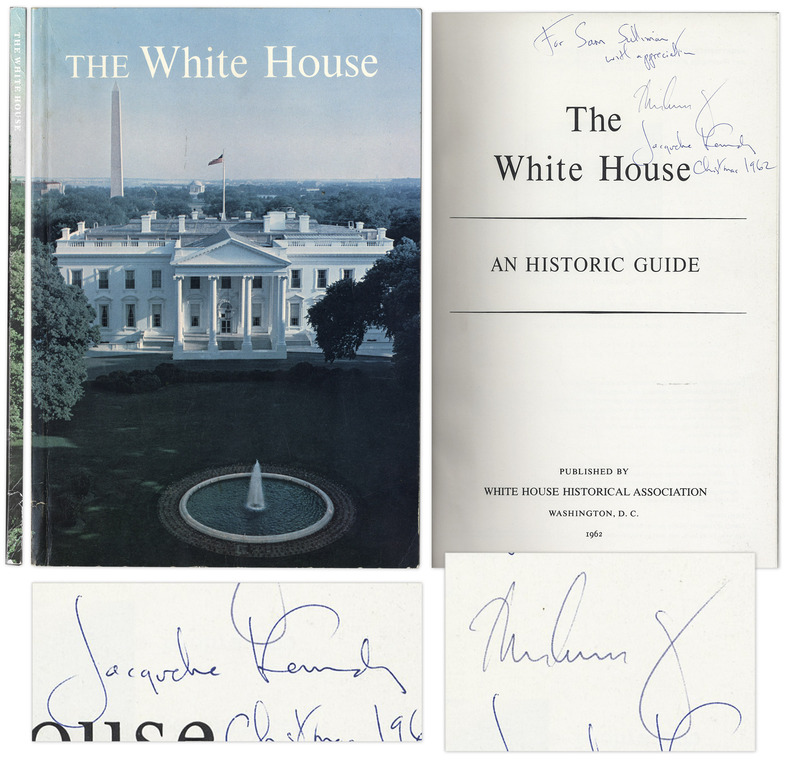 Upon the title page, Jackie inscribes, ”For Sam Sulliman / with appreciation / Jacqueline Kennedy / Christmas 1962”, with John F Kennedy autograph, ”John Kennedy”. Sam Sulliman was a U.S. Secret Service agent for over 20 years, and appears in the infamous photo of LBJ being sworn in as President aboard Air Force One. Softcover book is profusely illustrated throughout, running 132pp. Measures 6.75” x 10”. Light wear to spine, otherwise near fine. Sold for $3,438. 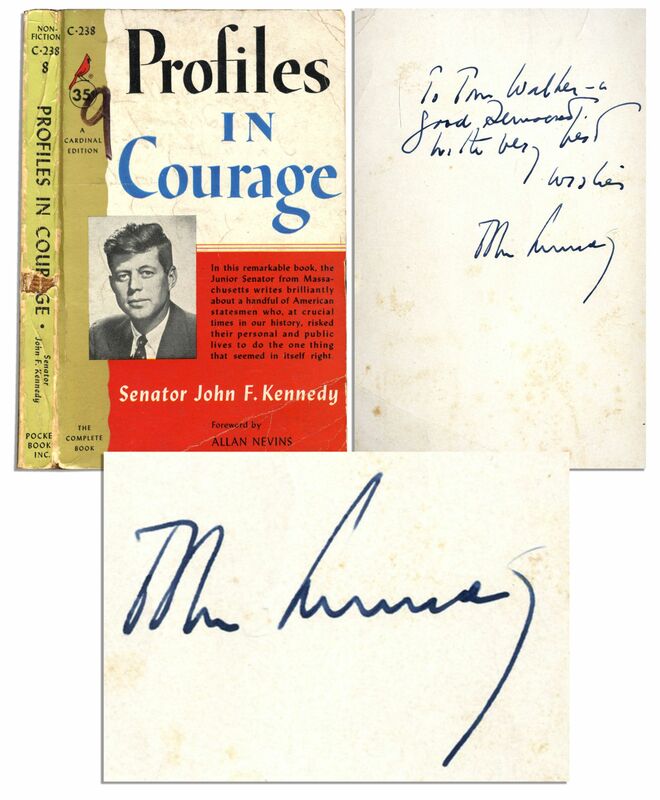 John F. Kennedy autograph in a copy of ”Profiles in Courage.” Cardinal edition published by Pocket Books, Inc.: New York: 1957. He pens ”To Tom Walker – a good Democrat / With very best wishes / John Kennedy” in blue ink inside the front cover. This Pulitzer Prize-winning biography chronicles eight U.S. Senators who withstood political repercussions in championing causes they believed in. Paperback book measures 4” x 6.5” and runs 231 pages. Toning, paper loss to spine and chip to backstrip. Very good condition. Bold John F Kennedy autograph. Accompanied by PSA/DNA COA stating that the John F Kennedy autograph is authentic. Sold for $3,049. John F. Kennedy autograph on a typed letter on 18 December 1962, thanking Washington DC Police Chief Robert V. Murray for his service in the wake of the Cuban missile crisis and Civil Rights demonstrations of that year. Upon White House stationery, letter reads, ”Dear Chief Murray / I want you to know how much I appreciate your many courtesies to me and the members of my staff during the past year. You and the members of your department have been extremely kind and thoughtful to us. Wishing you and yours a very happy holiday season…John Kennedy autograph”. Letter measures 6.75” x 9”, framed to 33.5” x 21.5” and weighing 9 lbs., 4 oz. Near fine. With a COA by John Reznikoff of University Archives certifying the John F Kennedy autograph. Sold for $2,420. John F. Kennedy autograph on a typed letter as Senator from Massachusetts. Dated 21 April 1954, letter on JFK’s Senate stationery reads, ”Dear Mr. Coltin: I am very sorry to be so long in writing, but your letter in regard to Mr. Joseph Markham was apparently lost in the mails and has just now come to my attention. I am enclosing herewith the letter to Mr. Markham as you suggest. With every good wish, Sincerely yours, [signed in black ink] John F. Kennedy”. Dark John F Kennedy autograph. Single-page letter measures 8” x 10.5”. Near fine. With PSA/DNA COA certifying the John F Kennedy autograph as authentic. Sold for $1,563. FREE APPRAISAL. To buy, sell or consign a John F Kennedy autograph, John F Kennedy document signed or a John F Kennedy autograph letter signed, please email Nate@NateDSanders.com or call Nate D. Sanders (http://www.NateDSanders.com) at (310) 440-2982. Thank you.